When is the last time you have attended a traditional dinner party? If you are like most, it’s probably been a while. Bygone are the days of a traditional “dinner party”- indoors or out. Family gatherings and other parties are moving away from the formal dining room table and outside, into a more casual and intimate setting. Where once a multi-course meal was the center of attraction when entertaining, today, the trend is to gather around a glowing fire and meaningful conversation as the main event. Choose ultra-plush and comfortable seating. An uncomfortable chair makes someone want to leave. Think about the seating at fast food restaurants for example. Make your guests feel comfortable to stay and have a good time by providing comfortable deep seating. Create multiple gathering areas. If space allows, having a few different areas for smaller groups to hang out. 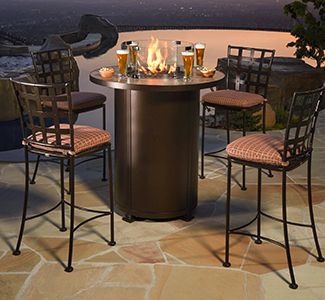 This encourages mingling and conversation. Accessorize! Don’t forget items like side tables, buffet carts, and rugs to add that finished touch. Ottomans are a nice accessory that can also be used as additional seating. Don’t forget the details. Make sure you have adequate lighting for an evening event, and shade for the day. The ability to play music in your outdoor space is another great addition to your outdoor entertaining arsenal. Lastly, it is important to consider how YOU will use the space you are creating to entertain. Important points to consider when purchasing include how large your space is, how many people do you typically host at a time, and what the climate is like where you live. Make sure the items you choose will be functional as well as beautiful. With these tips and tricks, you are sure to choose outdoor entertaining pieces that make party planning a breeze. 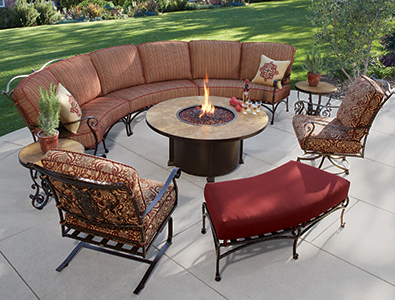 OW Lee offers many solutions, from a multitude of fire pit sizes, to super comfortable and stylish seating, that will help you create a space that will wow any party goer.